The economic spokesman of the ruling League Party says the euro will collapse unless the European Central Bank limits the gap between euro zone countries’ bond yields to 150 basis points. That bar is too low and would give big spenders free rein to dodge hard budget decisions. 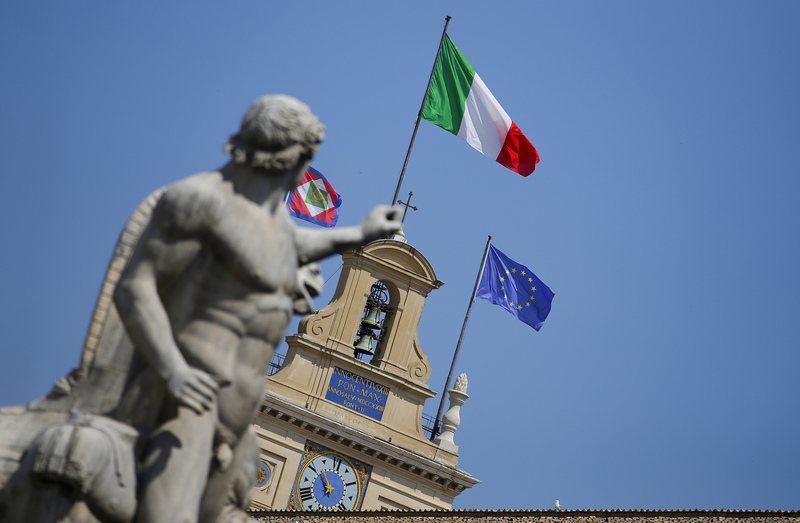 The Italian national flag flutters atop of the Quirinale presidential palace in Rome June 26, 2013. The economic spokesman of Italy’s ruling League party said on Aug. 13 that the euro zone will collapse unless the European Central Bank agreed to limit the difference between member states’ government bond yields. Borghi said the ECB should guarantee that yield spreads between euro zone government bonds would not exceed a certain level, suggesting 150 basis points between the yields of any two sovereign bonds as a reasonable maximum. The difference, or spread, between Italian and German 10-year government bond yields was 270 basis points on Aug. 21 at 0745 GMT.